And so many other things! There is a wealth of research to support the orthomolecular use of Vitamin C for these things but this post is instructions on how to do the high-dose C therapy so that's what we'll focus on here. You can click on this link here for "Why I'm not a purist" to see some of the research to back up the use of isolated Vitamin C. Whole food-based Vitamin C will not be effective in this type of therapy. You can also click here to peruse the Journal of Orthomolecular Medicine for studies and information on high-dose Vitamin therapy. It will not interact with any medications. It is safe for infants but only if a pure isolated ascorbic acid is used that contains no other ingredients whatsoever. An isolated Vitamin C powder (ascorbic acid or sodium ascorbate) must be used. A supplement with other ingredients cannot be used for high-dose C therapy. Sodium ascorbate is buffered so a good option for those with a sensitive stomach; otherwise generally ascorbic acid is best and tolerated well by most people. If doing high dose C or high maintenance doses indefinitely, I recommend ascorbic acid over sodium ascorbate to prevent the possibility of sodium levels getting too high. High-dose Vitamin C does not cause kidney stones. It actually can help dissolve them. Click here for more info. Vitamin C should never be abruptly stopped after high-dose therapy. Taper down to maintenance dose gradually. For chronic issues like asthma, it is crucial that high-doses are used for flare-ups and that high maintenance doses (generally at least 60mg/kg/day) are utilized indefinitely to help reduce or eliminate the possibility of flare-ups/attacks. The following is the general dosage amounts for high-dose Vitamin C therapy. Keep in mind that this a general guideline and that the goal, especially in the case of infections, asthma attacks, etc., is to reach bowel tolerance. Bowel tolerance is one dosage less than the amount that causes loose bowels as this means the body's tissues are truly saturated. Doses of Vitamin C are given hourly due to how short-lived it is in the body. 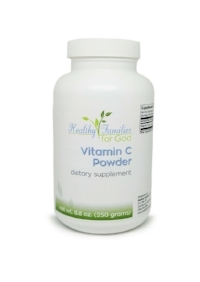 The body uses up Vitamin C extremely fast in times of sickness and stress (physiological as well as mental). Also, giving too much at once can cause loose bowels as well without actually saturating the body. 1,200 mg. 7-8 lbs. 9 130 - 135 mg.
Click here to read the full dosage instructions. Because high-dose Vitamin C therapy has been so helpful to my family and my clients, I searched for a good Vitamin C powder that I could use/offer. Click here for the one that I chose that is available to purchase. All of HFFG's supplements are produced in licensed manufacturing facilities that strictly adhere to current Good Manufacturing Practices (cGMPs). Products provided in tablet, capsule, and powder form are made in a manufacturing facility licensed by the State of California as a drug manufacturer and food processor and registered with the Food and Drug Administration as a drug manufacturing establishment. HFFG purchases them in small batches from the manufacturer as they are made fresh for us, so our customers have the freshest and most potent supplements available from this manufacturer. It is our hope and prayer that you find this information helpful. Thank you for helping support HFFG's mission to empower people with natural health information.